What year, model ,engine Cadillac? A short circuit or short to ground, also a faulty electrical part could cause the RSS (Road Sensing Suspension) to drain the battery. Which fuse are you pulling in order to stop the drain on the battery? The B11 20A fuse under the hood in the engine compartment fuse block? Or the D5 10A fuse? Depending on which fuse you are pulling, that would give you a clue as to which circuit to check. 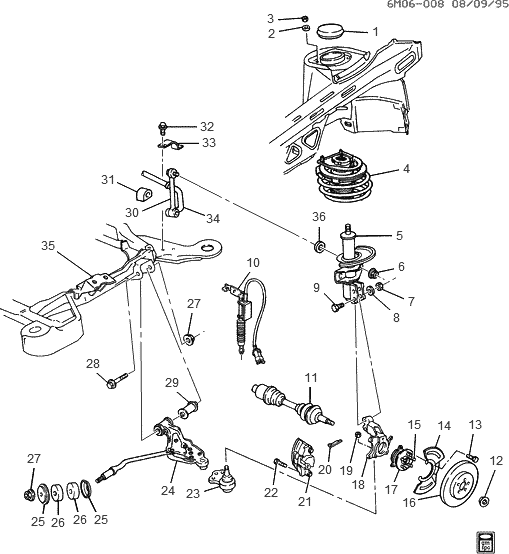 Here are the wiring diagrams, click here, here and here. This is for the early production, if they don't appear correct then perhaps it is late production, so let me know if they appear wrong. Anyhow, why would you want to bypass the rss? Why not find the short and fix it? Plus, I wouldn't really know how to bypass it, I assume perhaps you mean just do without it, then I would assume you would just pull the fuse or fuses for it as long as they don't power anything else you need. You seem to already have it narrowed down to the rss and even which fuse. Now, you would just have to find out what circuit within the entire fuses circuit has power when it is not supposed to. Then you would want to disconnect the negative battery terminal and hook up a voltmeter inline with the positive lead away from the battery post and the negative toward the negative battery post and get a reading of how many volts it is draining the battery. Then by looking at the wiring diagram isolate each circuit or part and disconnect each one at a time untill the drain drops to zero or at least under 0.1 volt. Then you would have to determine why, either a short circuit, short to ground or a faulty part, that is drawing current when it is supposed to be off so to speak. So then you may want to hook the battery back up and use a 12 volt test light or better yet the voltmeter and check what has power when it is not supposed to. let me know which fuse you are pulling to stop the drain, so I will know which circuits to look at. i pulled under the hood..second row, second from front..20 amp fuse...takes the draw from 2.73 to .03 ma. ok..assuming the distributor is 1a, and it is facing the front of the car, reading from left to right, that would make the "rtd batt" 2b...that is the one ive pulled..
Yeah, that is for the rss module. Ok as you can see from the 1st diagram, that fuse feeds the bottom of that module and the only circuits I see at the bottom are the 4 dampers, lr,rr,rf and lf, so I would start with them, disconnect each damper solenoid and see if the drain goes away. let me know if it does or doesn't. where is the damper located on the front right? the dtc is calling the right front damper open...? Chilton doesn't say anything about the RSS. I found a diagram. I assume the damper is part #10. 1991 cadillac: electrical problems..replaced battery..sits..fuses.